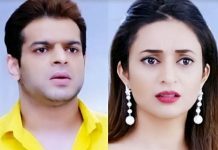 THIS TOP 15 SPOILER POST CONTENT IS DIFFERENT FROM SHOWS’S OTHER INDIVIDUAL POSTS…..
Sanam meets Sunehri and they both are shocked seeing each other. Sanam has seen the locket at her parents’ house and Razia has told her the truth that their look alike is her twin sister. Sanam runs away from Razia’s clutches and comes home. She sees Seher and is glad. Seher says she is innocent, and she did not do anything wrong. Seher hugs Sanam, but she is confused of what to do next. The goons come there to take Sanam, and Seher beats Sanam on her head, thus cheating her by acting to be sweet. She hits Sanam so that Aahil can’t see Sanam. Sanam falls off and Aahil does not see her lying on the ground. Seher starts acting and diverts Aahil. Seher makes the goons take Sanam back. She thinks she is safe now and will not lose any money. Seher chooses money over her sister. The goons take away Sanam and does not get into Aahil’s eyes. Sanam is going back to Razia’s clutches again. Seher starts feeling guilty and recalls Sanam’s happiness on her face when they both met. Will Seher try to save Sanam and understand their bond? Rocket tries to get closer to Aaliya and gives her a surprise, showing his love/madness for Aaliya. Rocket got all her pics on the wall and decorated the room beautifully. He wants to express his love and tries holding her. Aaliya does not get happy and gets away from him, as she feels Rocket’s behavior is different than Zain. Even Surayya has seen Zain in market and feels its his lookalike. Aaliya is not comfortable with Rocket and has kept him in her doubt. She maintains distance from him. Zain is in hospital and offers Namaz praying to get his family back. Zain and Rocket will be confronting each other in Barkat Royale and much family drama and conflict will be there. The show is going towards its end, so all will get well. Everyone has mocked Urmila’s death to scare Radha. The show drags this track more and soon Urmila will be scaring Radha as the ghost. Urmila gets the final rites done and is shown burnt infront of Radha. Radha is blamed for her death and she tries to balance her life. Urmila will start scaring Radha once they all get home. Urmila gets after Radha, to scare her to the fullest and make her run away from Modi house. They want to send Radha to jail and everyone is doing the drama well and shedding fake tears. Anandi falls into a problem, as her saree end gets caught in the car door and the car starts going. She had come to drop Amol to school and calls Amol for help. Amol gets shocked seeing her in problem and rides the wheelchair to her. Anandi goes far from him, and he leaves the wheelchair to save her. He runs to her and Anandi is shocked seeing this miracle. She gets the saree end freed herself and runs to Amol. She hugs Amol as her efforts have worked, she has made him stand on his feet. She did not know Amol will get fine, and the family gets happy seeing Amol walk in on his feet. Anandi’s dream turns true. Pragya starts leaving the house. Abhi stops her and takes her bag, as he is doing this for Dadi. He is worried for Dadi’s health and asks Pragya to stay back. Will Pragya win Abhi’s heart? Abhi says he did not expect this from Suresh too, and is angry on him. Pragya thinks to take Suresh’s help and clear the MMS matter. While she got time to stay in Abhi’s house, will she expose Aaliya’s evil plan? Ishani and Falguni have an argument. Falguni asks Ishani to accept Ranvir by her heart. Ishani complains about Ranvir and says she won’t share her life with him. Falguni says she is his wife and she has to stay with him forever. She explains her that she should see Ranvir’s goodness and she is lucky to have him, instead Chirag. Ishani is angry and does not understand. She tells Falguni not to compare Ranvir’s goodness with her dad’s genuineness. Falguni asks Ishani to respect Ranvir and end the hatred in her heart. Jalal has punished Salim to leave the palace, as Salim has done a mistake of plucking mango for his friend Anarkali. Jalal punishes him to stay with ordinary people. Jodha cries and hugs Salim. The time comes when he has to leave the palace and is taken away from Jodha. Will Ruks support Salim to bring him on her side? Nisha is having tough time in being a part of Viraj’s shooting academy. She does her work well, but Viraj asks her to do some good work to impress him. He says you did not do any such work, and her interview does not get well. He asks her to leave. She gets angry as he did not ask any question and rejected her. She thinks why is he avoiding her. He starts taunting her. She feels he is behaving weird, being a good person. She gets frustrated as he does not remember her name. Nisha finally becomes a part of his academy and his life. 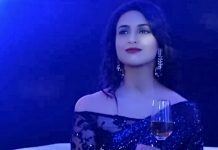 Ishita is upset as she was teased in Ashok’s party. She cries feeling scared. Mrs. Bhalla hugs her and asks her to forget everything. Raman comes to her and sees her crying. He holds her and she goes far, being scared thinking of the bad happenings of the party. He comforts her and she tells him everything what happened. Raman gets angry on Ashok and Parmeet and pacifies her. He hugs her and can’t see her crying. He feels her pain and cries with her. Raman decides to teach a lesson to those cheapos, and calms down Ishita making her sleep. Shagun and Simmi have to see Ashok and Parmeet’s truth. Ishita got very humiliated in that party after the eve teasing, and she finds herself safe in Raman’s presence. He tries to swipe her trauma being a good husband. He sits by her side as she sleeps. Raman supports her by love. Simmi apologizes to Ishita as her husband has also teased her. Ishita asks her not to apologize, and hugs her. Raman looks on and gets angry seeing his wife and sister crying because of Parmeet and decides to make Parmeet pay the price. Suhani does not know about Yuvraaj and Soumya’s love story. Suhani takes Soumya to her home and meets her family. She comes to know her Bua ji is ill, and gives some money for her treatment. Pankaj refuses to take money from her. Suhani feels bad and asks him to take money if he regards her as his son. Pankaj agrees. Soumya starts feeling jealous as Suhani looks financially secure. Will Soumya fall in Dadi’s trap and end her marriage with Krishna? Ishaan and Samrat come face to face and does not get along well. Ishaan knows Samrat’s true face and calls him selfish and self centered. Ishaan’s rudeness and cutting off their friendship makes Samrat worried. Samrat gets scared that Ishaan can do anything against him. Samrat meets the lawyer to take away all the rights from Urmi and even take away the custody of Shaurya. Veera goes to attend Baldev’s haldi ceremony and tries to create a scene in her style. She tackles Simran and wants to catch Simran’s plan being close to her. Simran praises herself and Veera tries to make her fall in her own words. Veera and Baldev try to make each other jealous. Ranvi thinks to get Veera married to Rajveer. Veera catches Simran’s lies but tries to show her true side to Bansuri, but Amrit covers up for Simran. Veera pledges to get back Baldev and his love. His friends Jaggi and Billa start supporting Veera in exposing Simran and to win Baldev’s love. Cabir has dealt with Harshad in his own way and settled the scores by humiliating him by the video. While Raghav is happily spending time with Cabir, they both face a blow by Harshad’s goons and get wounded. Manik and Nandini take Cabir to hospital. While Navya confesses her love to Harshad, even after seeing his funny embarrassing video. Harshad kisses her, after being slapped by Mukti as his love confession did not work out on Mukti. Mukti catches Harshad’s double face and hates him. Manik is jealous to see Nandini with someone else, and suppressing his feelings. Will Manik admit his feelings to Nandini and stop hurting her by his rude behavior? Sooraj is undeterred by Prema and Disha’s truth. He takes Gautam’s help in teaching the terrorists a lesson. He tells Bhabho that we are 78 and they are just 3, so if we become strong, we can overpower them. Babasa gets angry on Sandhya for not being to catch the culprits at home and not safeguarding Sooraj and Bhabho. She gets upset and can’t get relations come between her duty. Sooraj tries attacking Prema, but fails. Gautam asks him to wait for another chance. RK’s hanging gets stopped and Maya asks them to release RK. Arjun hatches a plan to fool Maya. On the flight, Sooraj acts brave and he will be the hero to free all passengers from the hijack. Much action and emotions ahead in the show.